The Ainsworth 2014 release takes you straight to China where a friendly panda dwells in a bamboo forest waiting to help you cash in some nice winnings. Panda King is a traditional slot machine featuring simple graphics and generic sounds in the base game. If you are lucky enough to trigger free games, you can enjoy vivid visuals with a different reel set and an energetic soundtrack. The 5-reel slot with 20 variable paylines will provide you with some old-school entertainment. Without leaving the comfort of your home, you can enjoy the real casino action with the panda helping you create more winning combinations and win up to 20,000 coins in a single spin. The free spins feature offers three options you can choose from. During the base game, the reels are populated by high-value symbols depicted as a waterfall, golden coin, lotus flower, pergola and ingot. Playing card symbols fill the rest of positions and pay prizes of a lower value. The panda stands for Wild while the Yin Yang sign represents Scatter. During free games, another high-value symbol is introduced. It is the Chinese character reading fortune and its role will be explained later in the review. 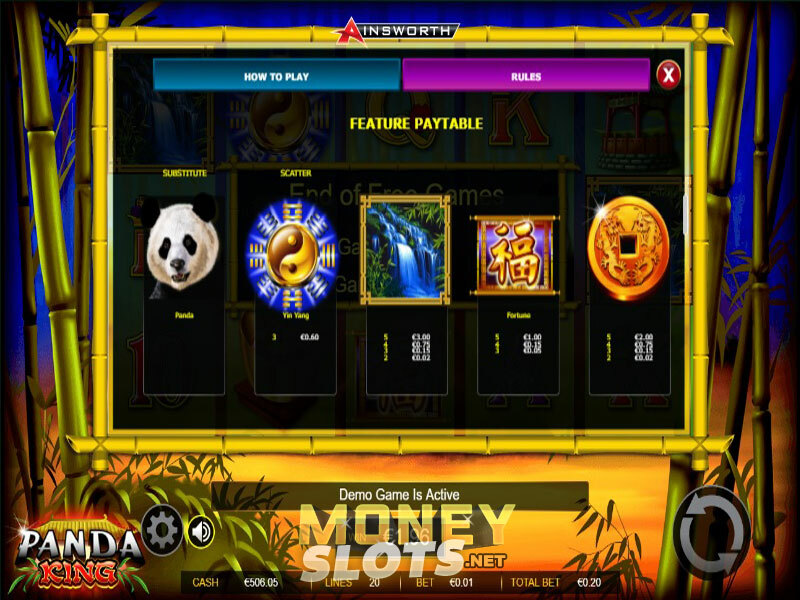 The Panda King slot uses 5 reels and 20 adjustable paylines. Before you set the reels in motion make sure to choose a number of paylines you want to play at and a coin value. It can be anywhere between $0.01 and $100, so your total bet can start at $0.20 and go all the way up to $2,000, which will suit high-rollers particularly. This applies if you keep all paylines active, which is preferable for the best odds of winning. The game offers the Autoplay option allowing you play up to 100 uninterrupted spins. Land at least two or three symbols of a kind in a row on an active payline left to right to win a prize. Look out for 3 or more Yin and Yang Scatters to unlock the free spins feature. You will be offered to choose from 3 options. They include 12 free spins during which the coin, waterfall and pergola symbols on the reels 2, 3 and 4 are replaced by Panda Wild, 10 free spins with the coin, waterfall, pergola and lotus flower symbols replaced by Panda Wild on the three central reels and 8 free spins during which coin, waterfall, pergola, lotus flower and ingot symbols will be replaced by Panda Wilds on the three middle reels. We have previously mentioned the fortune symbol that shows up during free games only. It can appear in stacks and if it creates a five of a kind combination with 2 Panda Wilds, you will win a doubled prize. In case 3 Panda Wilds contribute to such a combo, your payout will be tripled. The selected free spins feature can be retriggered if you land 3 Scatters anywhere in view during free games. Panda King is a simple yet effective game that will play smoothly across all devices. If you like to play slots on the go, give the Ainsworth product a try and you can win up to 20,000 coins in a single spin.